Charleston shooting: The flags in Dylann Roof’s Facebook profile photo are hate symbols. See those two flags on his chest? They are hate symbols. 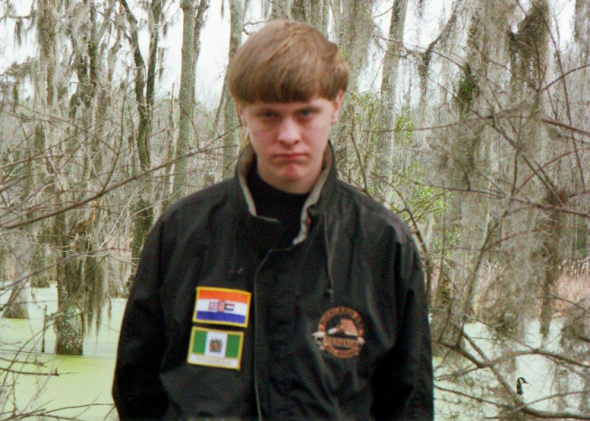 After FBI officials identified the suspected shooter in Wednesday’s attack on a historically black church in Charleston as Dylann Roof, news outlets, including Slate, were quick to point out that Roof’s Facebook profile photo features him wearing two emblems of white supremacy: the Rhodesian flag and the flag of Apartheid-era South Africa. Some, like Fox News’ Steve Doocy, have questioned why the attack—in which nine were killed—was being investigated by officials as a hate crime. The patches (along with the venue and other details of the attack) are an indication that this was a mass murder motivated at least in part by racism. One of the symbols worn by Roof in the photo, the Apartheid-era South African flag, is listed in the Anti-Defamation League’s database of hate symbols, “Hate on Display.” The ADL says that after the end of Apartheid, the flag became a symbol for hate groups. “Since 1994, white supremacists in South Africa and elsewhere around the world, including the United States, have adopted the 1928 flag as a symbol of white supremacy,” the site reports. In 1994, The Independent reported on how defenders of Apartheid were dealing with the transition to a new government and a new flag: by adopting the old one as an icon. The flag was “destined to become a symbol of resistance,” the newspaper said at the time. Mark Pitcavage, the director of the ADL’s Center on Extremism, says South Africa is especially important at the moment to hate groups in this nation as well. American white supremacists “have convinced themselves, along with the help of some South African white supremacists, that ‘white genocide’ is actually going on in South Africa and that the rest of the world will follow,” Pitcavage told me. There have even been South Africa-focused white supremacist rallies in the United States in recent years, Pitcavage notes. According to Pitcavage, the symbol is used primarily by individual white supremacists. But because of its connection to a former South African white supremacist living in the United States who has pushed the “white genocide” narrative, the Aryan Nation is the one group that has used it in a more systemic fashion. The second patch seen in Roof’s photo, that of the former racist government of Rhodesia, has a similar connotation for white supremacists, but is less popular and thus not yet in the ADL’s database. “Rhodesia was almost sort of like a mini and more extreme version of Apartheid South Africa until white rule was overturned in 1979,” Pitcavage said. Rhodesia, which became Zimbabwe in 1979, has had special significance to white supremacists for years. Robert Mugabe has ruled there since 1980, and in 2000 he began seizing land from white farmers. Mugabe’s violence and corruption has not exclusively targeted whites—in the early 1980s his army committed atrocities against the Ndebele minority tribe that left more than 10,000 dead and has been described as a genocide—but his incompetent rule has become a rallying point for hate groups. “Whites actually were persecuted in Zimbabwe after the end of white rule and so white supremacists dating back all the way to the early 1970s have had a fascination with or concern over Rhodesia/Zimbabwe,” Pitcavage noted. Correction, 2:40 p.m., June 19, 2015: This post originally quoted Mark Pitcavage as talking about “white on black” crime. Pitcavage misspoke. He meant to say “black on white” crime.